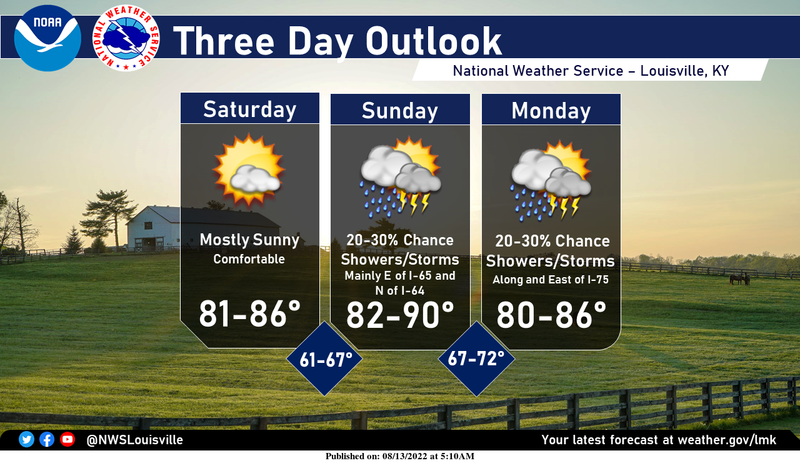 A joint service of the UK Ag Weather Center and the National Weather Service. boundary will push in late in the day and may kick off a few showers. 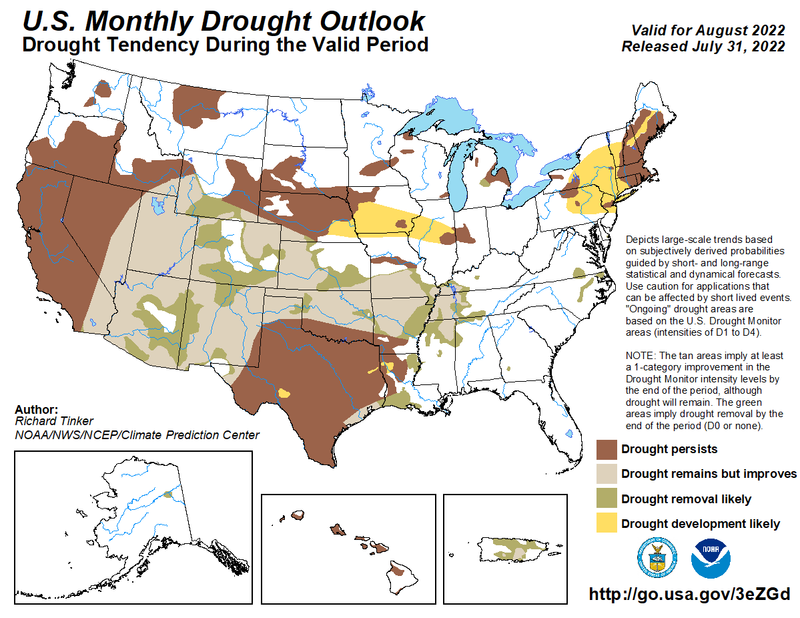 USDA's Ag Weather:National Ag. Weather Outlook, International Ag. Weather Summary ,International Highlights , Next Weather Event? Click here for UKAWC Point Agricultural, Lawn & Garden Forecast/Outlook in case of corrupt tables. Across Kentucky...temperatures are near 58 degrees west, near 52 degrees central, and near 57 degrees east. Current sky conditions are fair west, cloudy central, and cloudy east. In the west, relative humidity is near 66%, and the dew point is near 47 degrees. In the central part of the state, relative humidity is near 77%, and the dew point is near 45 degrees. In the east, relative humidity is near 89%, and the dew point is near 54 degrees. Current drying conditions are fair west, fair central, and poor east. Winds are from the west at 14 mph with gusts at 23 mph west, where conditions are not favorable for spraying due to strong winds. Winds are from the west at 16 mph with gusts at 30 mph central, where conditions are not favorable for spraying due to strong winds. Winds are variable at 5 mph east, where conditions are favorable for spraying. Based on current available observations, the highest temperature is 60 degrees at Bowling Green. The lowest temperature is 50 degrees at Covington. DAY ONE  Today and Tonight. 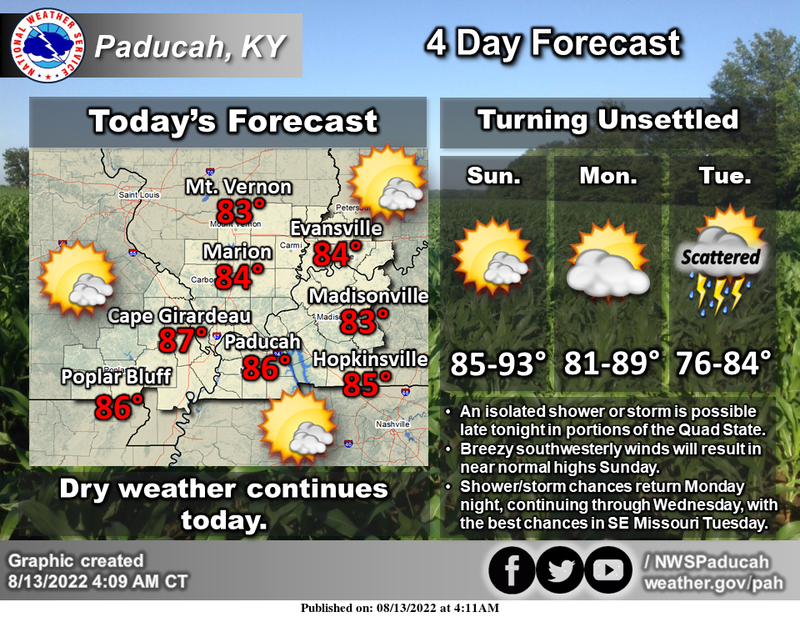 Thunderstorms are possible today, mainly in far eastern Kentucky. Northwest winds gusting up to 30 mph are possible today. DAYS TWO THROUGH SEVEN  Saturday through Thursday. Spotter activation is not anticipated. Becoming partly sunny in the afternoon. Showers and a slight chance of thunderstorms. Highs in the mid 60s. West winds 10 to 15 mph with gusts to around 25 mph. Chance of rain 90 percent. Cooler. Mostly clear. A 20 percent chance of rain showers in the evening. Lows in the upper 30s in the valleys and in the lower 40s on the ridges. West winds around 10 mph in the evening becoming light. Sunny in the morning then becoming partly sunny. Highs in the upper 60s. Light winds. Mostly cloudy with a 20 percent chance of showers. Lows in the mid 50s. Light winds becoming southwest around 10 mph late. Mostly sunny. Highs in the upper 60s. West winds around 10 mph. Mostly clear. Lows in the mid 40s. Mostly sunny. Highs in the lower 80s. Mostly cloudy. Lows in the upper 50s. Partly sunny. Highs in the lower 80s. Partly sunny. Highs in the mid 80s. Mostly cloudy. Lows 58 to 63. 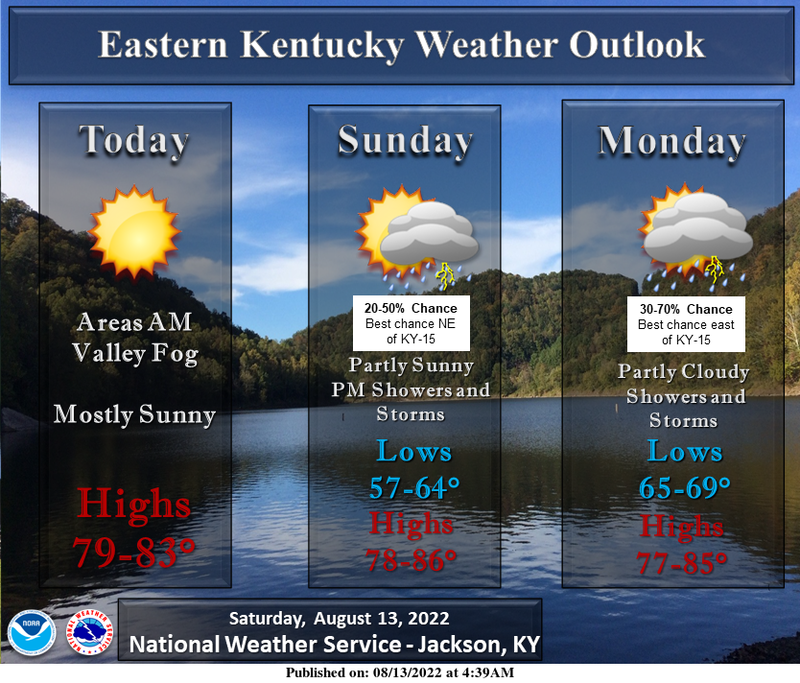 Mostly cloudy with a 40 percent chance of showers and thunderstorms. Highs in the lower 80s. Note: Due to rainfall variability within each climate division, check Precip Reports/GIS Estimates and the Kentucky Climate Summary for the latest moisture information for this county. Temperatures for the period averaged 59 degrees across the state which was 2 degrees warmer than normal and 2 degrees cooler than the previous period. High temperatures averaged from 70 in the West to 72 in the East. Departure from normal high temperatures ranged from 1 degrees cooler than normal in the West to 2 degrees warmer than normal in the East. Low temperatures averaged from 49 degrees in the West to 49 degrees in the East. Departure from normal low temperature ranged from 2 degrees warmer than normal in the West to 7 degrees warmer than normal in the East. The extreme high temperature for the period was 86 degrees at LOUISA 1S and the extreme low was 32 degrees at HARTFORD 3E. Precipitation (liq. equ.) for the period totaled 1.86 inches statewide which was 0.86 inches above normal and 186% of normal. Precipitation totals by climate division, West 2.46 inches, Central 2.22 inches, Bluegrass 1.86 inches and East 0.90 inches, which was 1.30, 1.22, 0.94 and -0.02 inches respectively from normal. By station, precipitation totals ranged from a low of 0.40 inches at WILLIAMSBURG AWOS to a high of 3.91 inches at BRANDENBURG 4SW.